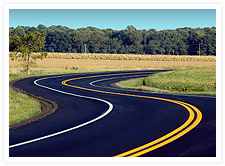 Highway Graphics LLC is fully equipped to handle Interstate, Highway, City and Rural road pavement marking and striping projects of any size. Our highly qualified staff has experience working with the LA DOTD and local municipalities to meet project deadlines and overcome difficult specifications. Our company has successfully completed projects for many states, cities, municipalities and private businesses. 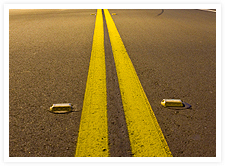 Highway Graphics LLC can perform Thermoplastic Traffic Striping and Pavement Markings, Painted Traffic Striping and Pavement Markings, Preformed (Tape) Traffic Striping and Pavement Markings, and removal of bad or deteriorated striping or marking. Thermoplastics have been used as a pavement marking material in the United States since the late 1950s and have been the most common pavement marking material used on roadways for years. Thermoplastic is so named because the mixture of plasticizer and resins that serves to hold all of the other ingredients together, exists as a solid at room temperature, but becomes liquid when heated. The popularity of thermoplastic markings can be attributed to several factors which include: readiness for immediate use; high durability; good retroreflectivity; and relatively low cost. We also do removal. 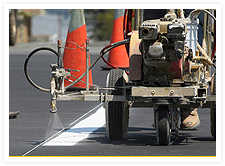 Traffic paints are the oldest and most widely used pavement marking materials in existence. 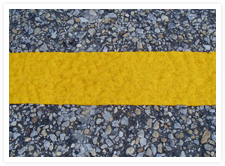 Paint is a common pavement marking material used by DOT’s today, although its use has recently declined as thermoplastic has become more popular. Paint still remains the most inexpensive of all pavement marking materials, although its cost has increased slightly as new formulations have been introduced. Paint is almost exclusively used for long-line applications, often in maintenance projects, and is currently the only long-line material applied by state forces. We also do removal. Preformed tapes are cold-applied, preformed pavement marking materials that are supplied in continuous rolls of various lengths and widths. Preformed tapes have the advantage over sprayed or extruded materials because they do not require expensive application equipment or experienced operators to place, and they require no drying or curing times. While tapes have a significantly higher initial cost than most other materials, the service lives are usually superior to most other materials, including thermoplastics, often making them a cost-effective choice in locations with high traffic volumes. Preformed tapes are frequently used for transverse markings, but are often used for longitudinal lines in high-traffic areas. Tapes are highly durable and abrasion resistant and are often used only in locations with the most severe traffic conditions. We also do removal.